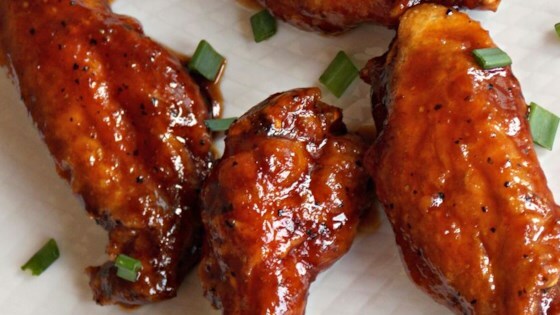 "Finger-licking good, Korean-style hot wings made easy and simple. The sauce can be made up to two weeks ahead of time; flavor will intensify." Stir soy sauce, brown sugar, ketchup, barbeque sauce, garlic, vinegar, chile-garlic sauce, pepper, sesame oil, and ginger together in a saucepan; bring to a boil. Whisk cornstarch and water together in a small bowl; stir into the sauce. Remove from heat and set aside to cool and thicken. Heat oil in a deep-fryer or large saucepan to 360 degrees F (182 degrees C). Season chicken wings with lemon-pepper seasoning. Fry chicken wings in batches of 6 to 8 at a time in hot oil until no longer pink at the bone and the juices run clear, 6 to 8 minutes per batch. An instant-read thermometer inserted into the meatiest part of the wing, near the bone, should read 165 degrees F (74 degrees C). Put cooked wings into a large mixing bowl. Ladle sauce over the wings and toss to coat. I make this sauce for my chicken every weekend and I love it! It's not spicy unless you add tons and tons of chili powder like me but I definitely end up licking my fingers everytime I eat these! This is really good sauce, very tasty. I will admit I added more hot chili sauce for a little more heat. Great recipe! The only alteration was I added 2 tsp of honey. I was afraid it was going to be really spicey but in the end it was just a perfect amount of spice. Next time I’ll add a picture.